To your nearest grocery store, or in our case, to the nearest Sam’s Club! You NEED to try the new Gluten Free Cheerios! And at Sam’s Club, you get 2 boxes bundled together at 1 pound 4.35 ounces apiece! 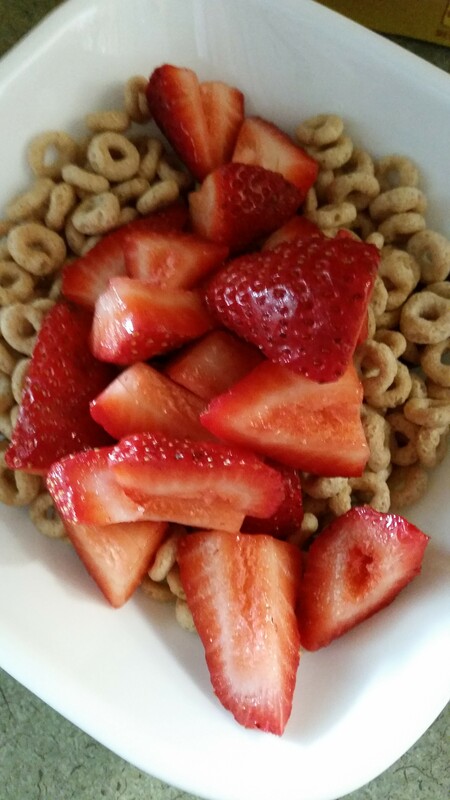 Oh so much Cheerios goodness to eat! 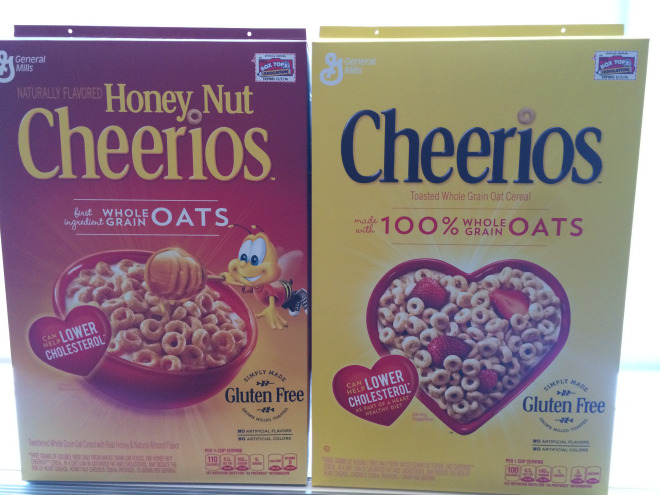 Why are we so excited about Gluten Free Cheerios? We haven’t eaten them in 13 LONG years! Since our diagnoses, this great little cereal and reminder of our childhoods has been off limits! 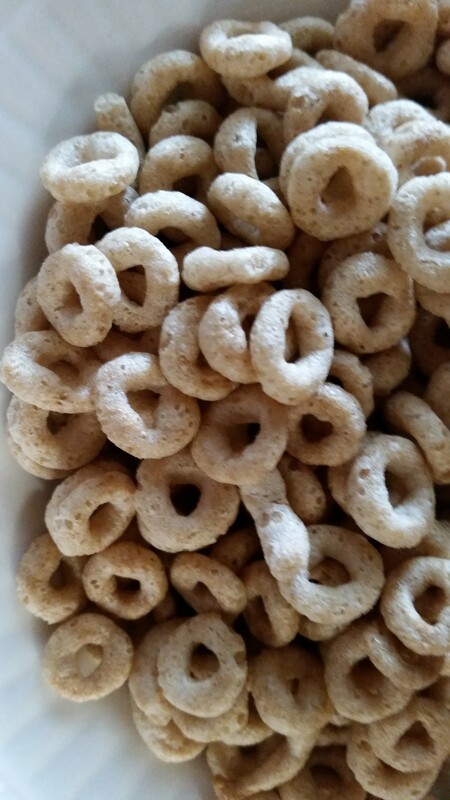 We were so hoping that the gluten free version of this classic cereal would be close to the original version….the little round O’s that we remember being so crunchy and standing up to the milk! Well, our hopes were satisfied! 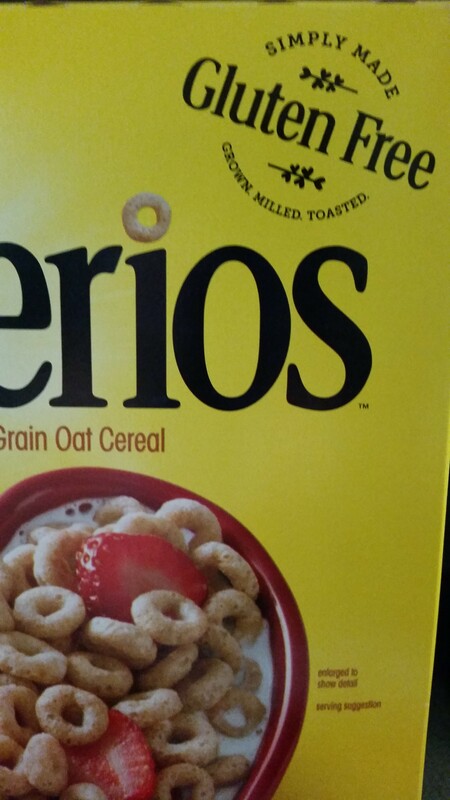 Gluten Free Cheerios tastes just like regular Cheerios! 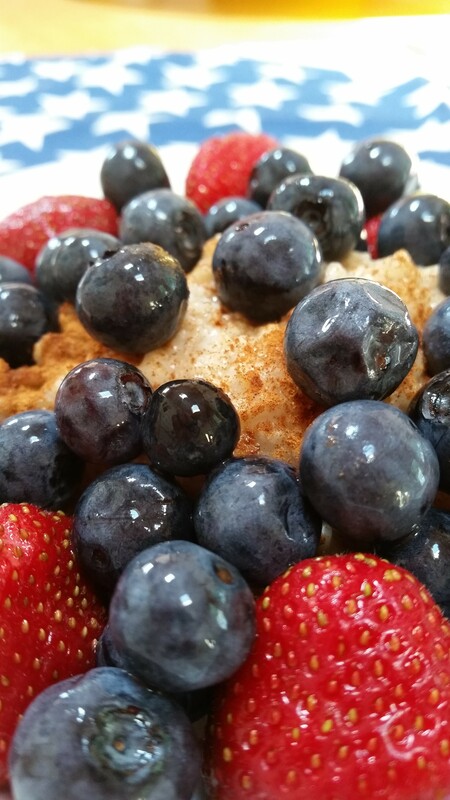 Oh we couldn’t wait to dive into a bowl this morning! 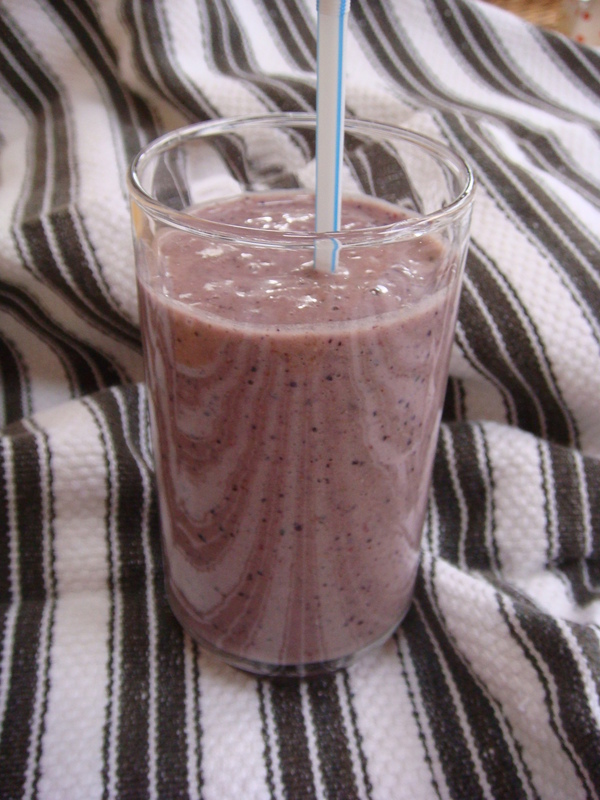 So we got out the dark chocolate almond milk, cut up some strawberries, and readied our taste buds! Isn’t it amazing how the simple things in life are the best? 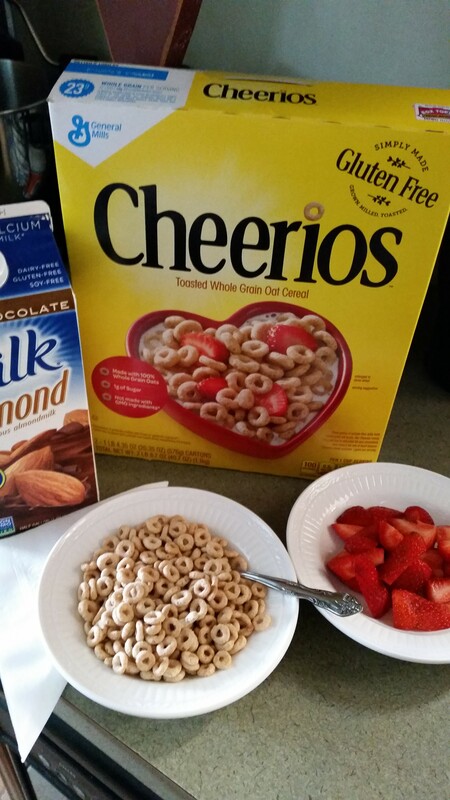 So make Gluten Free Cheerios a part of your breakfast routine again…and relive some happy moments like we are! 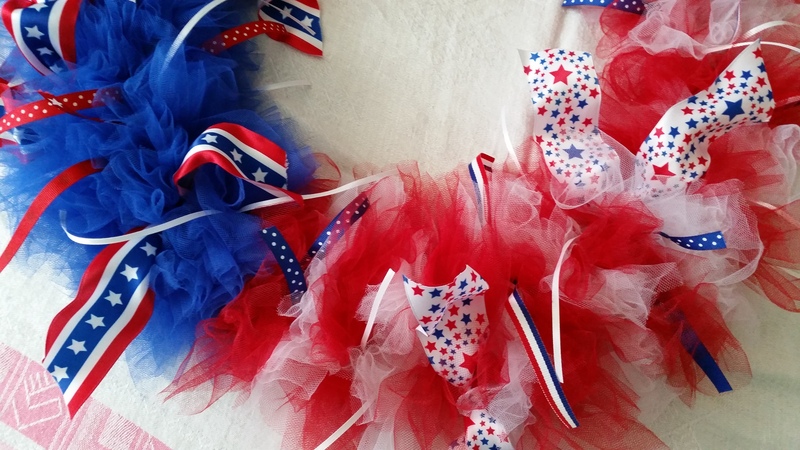 We are slowly approaching America’s birthday….and that means red, white, and blue! 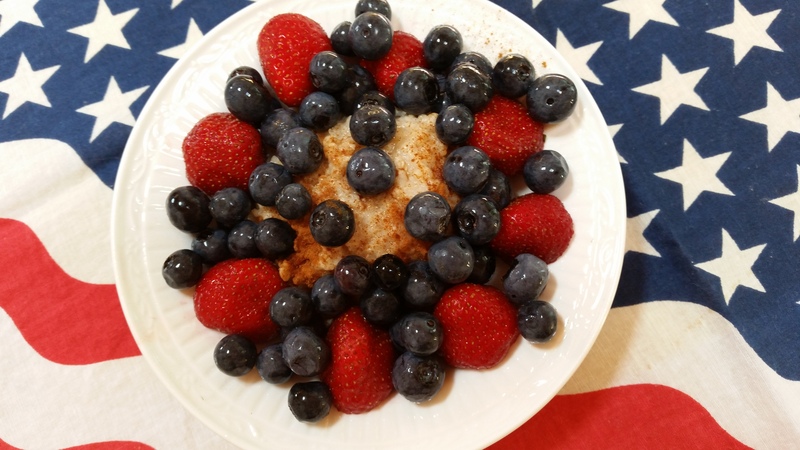 One of my favorite breakfasts is oatmeal with cinnamon sprinkled on it….so to be patriotic and add some wonderful antioxidants to my diet, I added a bunch of blueberries and strawberries! 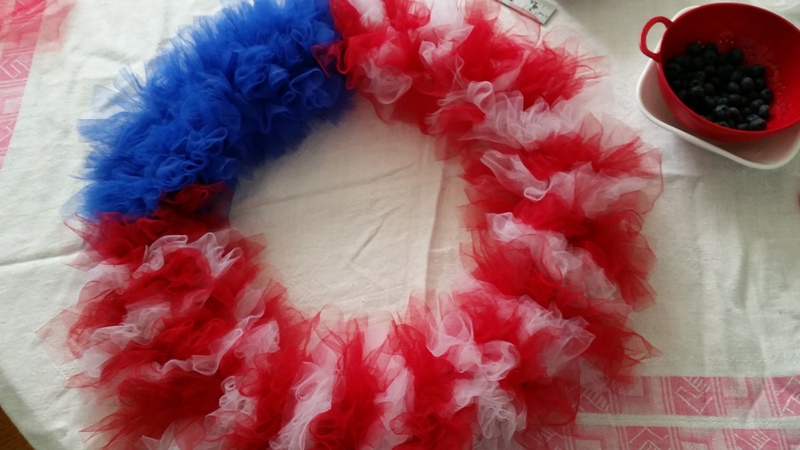 This post is a little different because in early June, in honor of Flag Day (June 14th), I made a red, white, and blue wreath for my front door. It was inspired by Meredith while reading her blog Wait ’til Your Father Gets Home. 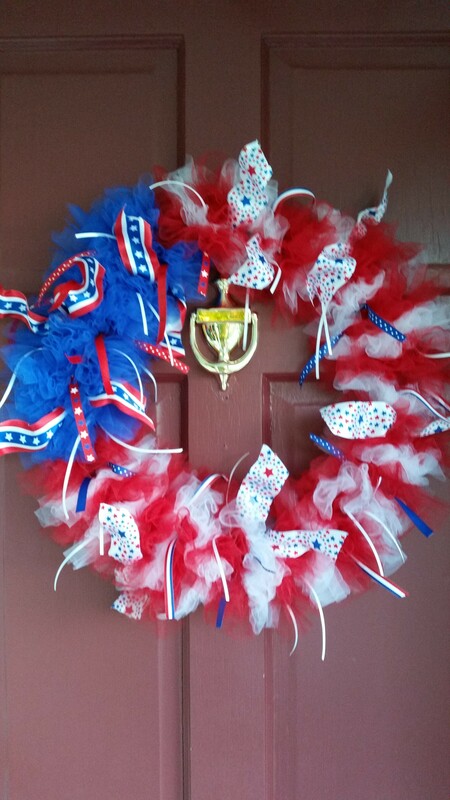 When I came upon her post and saw the wreath, I knew I had to replicate it! So thanks to Meredith! So I decided to add in a few pics of the way I constructed it…that way, you may be inspired, too! 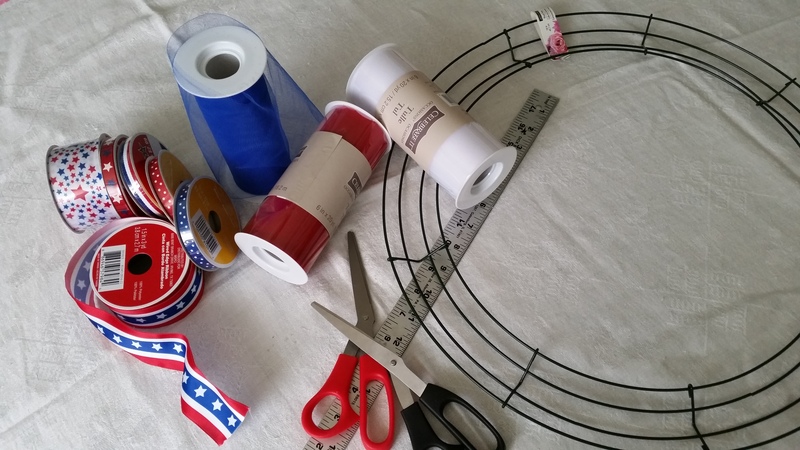 Gather your materials….you will need a wire wreath as shown; 3 colors of tulle (red, white, and blue); 4 spools of ribbon (red, white and blue designed) and 2 large spools of wired ribbon (red, white and blue designed); scissors or rotary cutter, and a ruler. 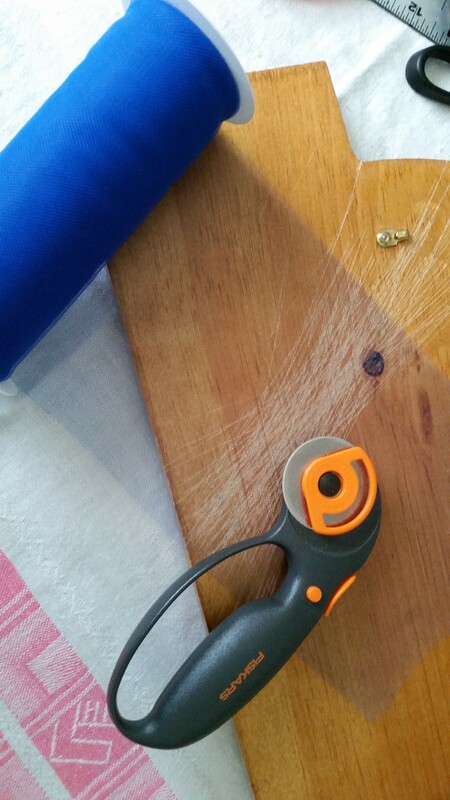 If you are using a rotary cutter, you will need a mat or cutting board (I used an old plaque). 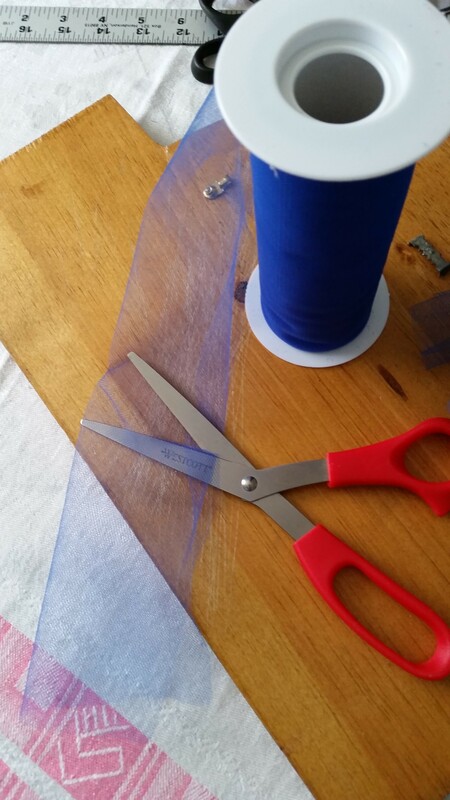 You will need to cut 96 total pieces of blue tulle to place on wreath…. 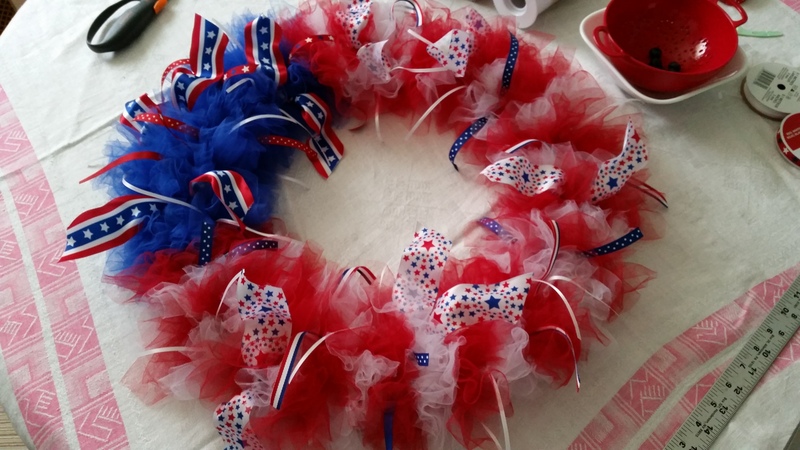 12 pieces on each wire using 2 of the 9 sections that make up the wreath. Then cut 112 pieces of white and 112 pieces of red. Place 8 total pieces on each wire alternating white and red. Put 2 red, then 2 white, etc. 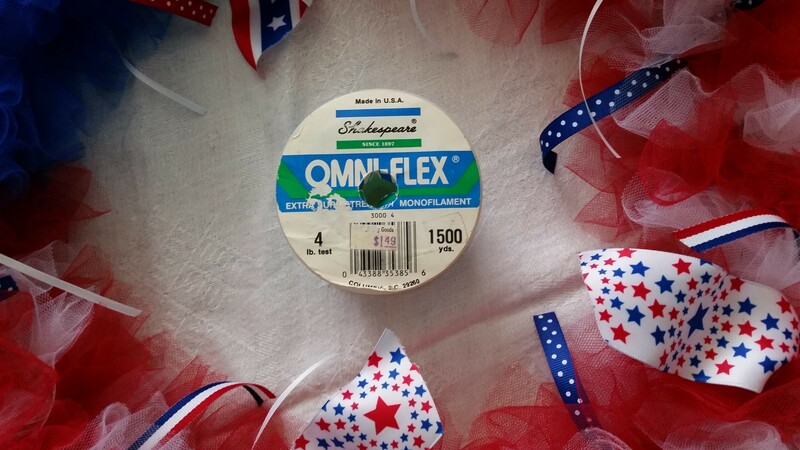 Place these all around the remaining 7 sections of the wreath. 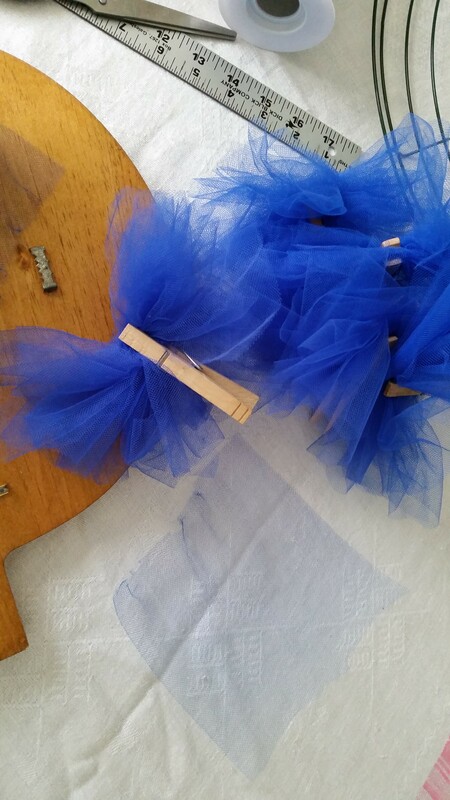 As I cut my tulle, I gathered the pieces into groups of 10 and clipped them with a clothespin. 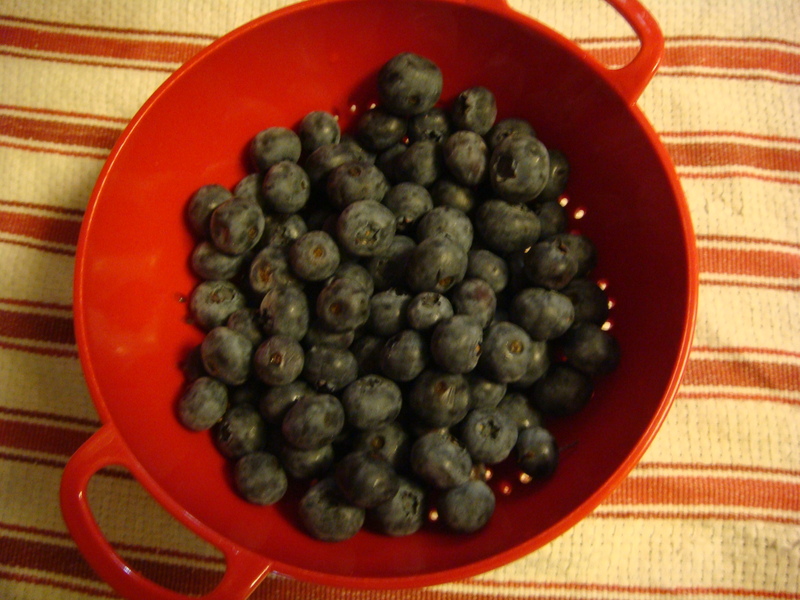 While I was making it, I enjoyed a bowl of blueberries in a red colander draining in a white bowl….planned? No, it just happened to be my mid-morning snack! 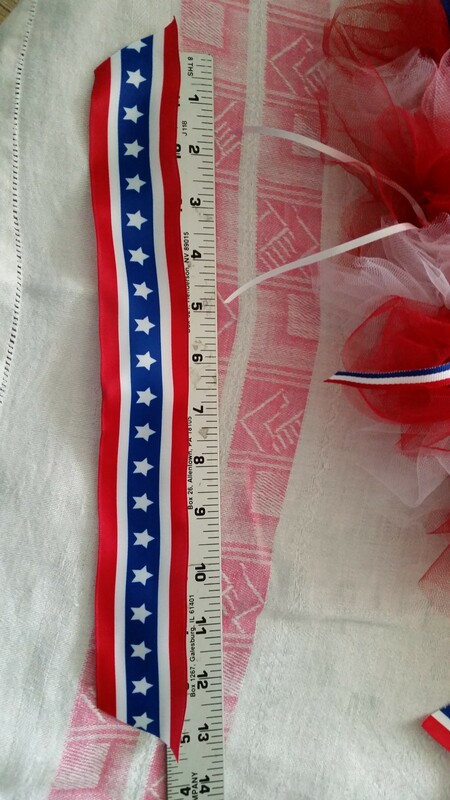 Now cut your ribbons….small ribbons with red white, and blue designs are cut to approximately 10 inches.., you can cut as many as you want. We also added in very fine white ribbon to our wreaths! 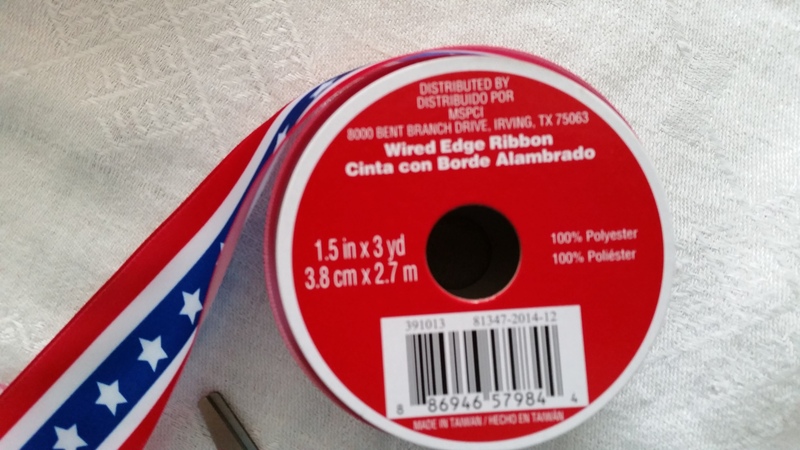 Make sure that wider ribbon that you buy is WIRED because it will make the final look amazing, as you can manipulate it! 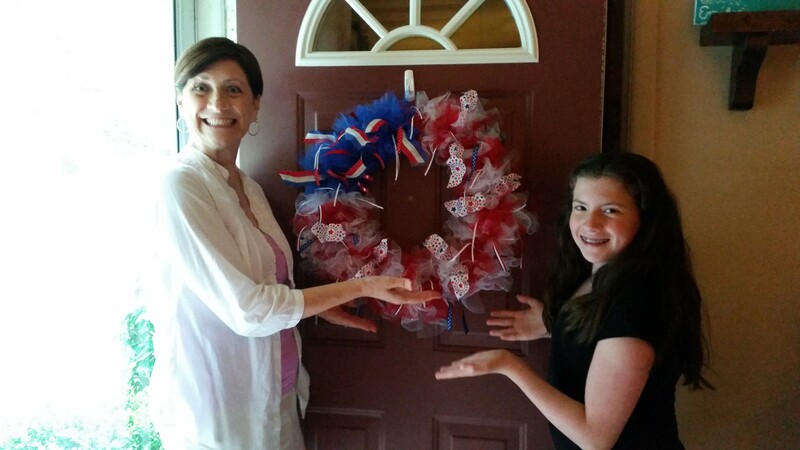 The wider ribbon is cut to about 13 inches and our wreaths had 8 pieces added. Three of one design and five of the other design! It’s looking great and the blueberries are disappearing!! Now to attach it to the door, we need to add some fishing line! 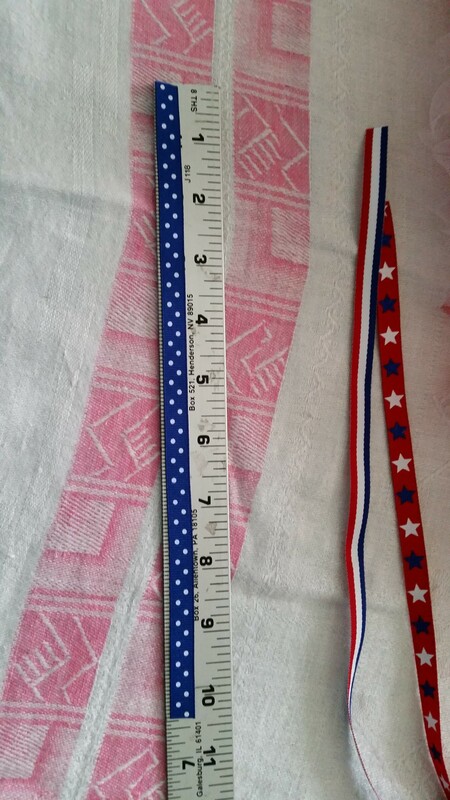 Do you see the pricetag on this line?? Holy cow, that’s how long I’ve had it! Anyway, once visitors to our home saw it, they, too, had to make one! 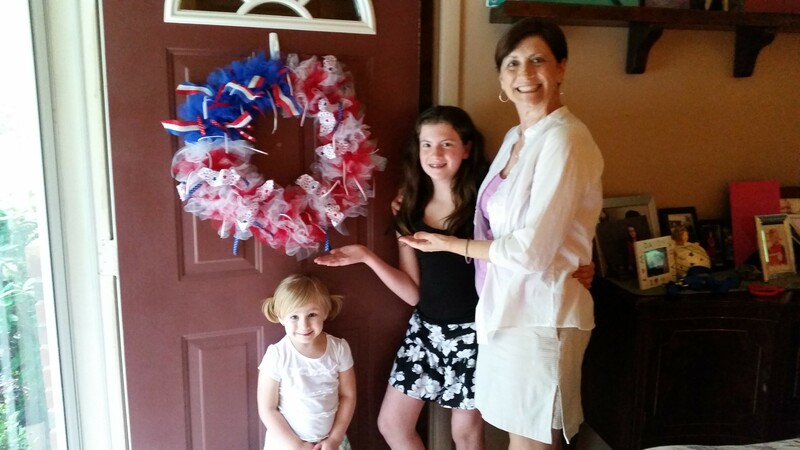 So my sister Maria started her wreath with the help of her sweet granddaughter, Emily. 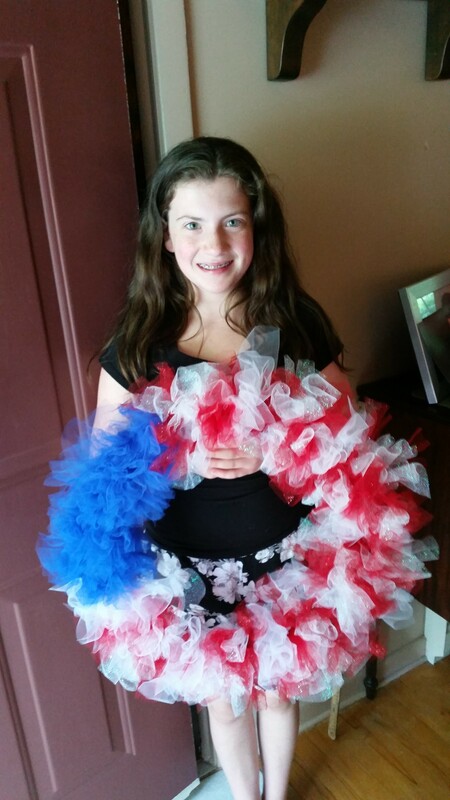 Emily, in turn, wanted to make one for her house, so now we are up to three! 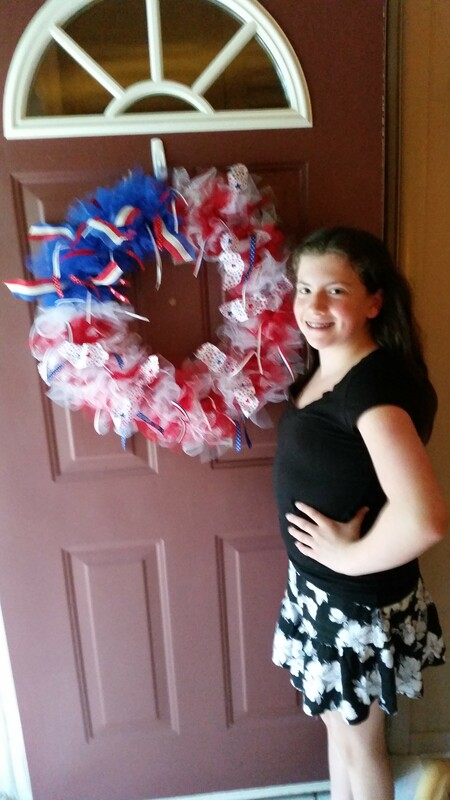 Emily’s is super special because we used sparkle white and sparkle red for her wreath! Didn’t Emily do a great job? She is super proud of her work, as she should be! And Gracie (my sister Maria’s other granddaughter) gets in on the act! Too cute for words! So what are you planning to do for the biggest birthday celebration in the world? Whatever you do, enjoy with pride and patriotism! This is a must-read for all of you who grew up with the iconic cereal, Cheerios! 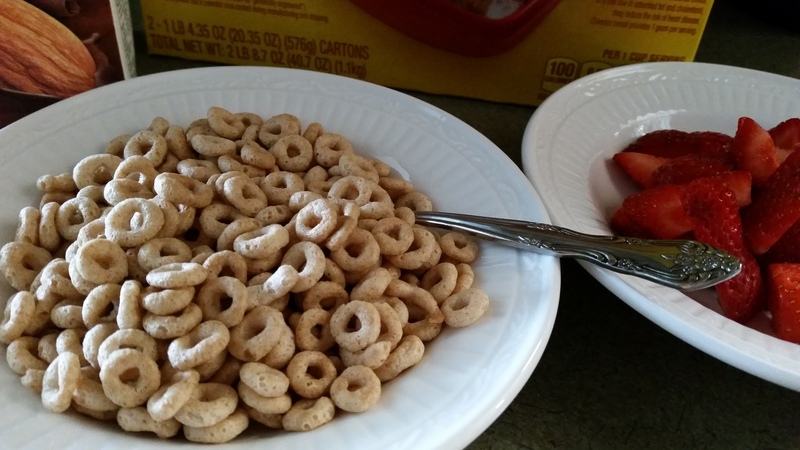 April Peveteaux wrote this great post to update the celiac community about one of our favorite breakfast cereals…great job, April!! Hello peeps! I’m freshly back from Minneapolis where General Mills is cooking up some gluten-free business. If you took part in the lively Facebook thread, you know that GM is changing the way Cheerios are made and as of this fall, 5 varieties of Cheerios will be gluten-free: Original, Honey Nut (woot! 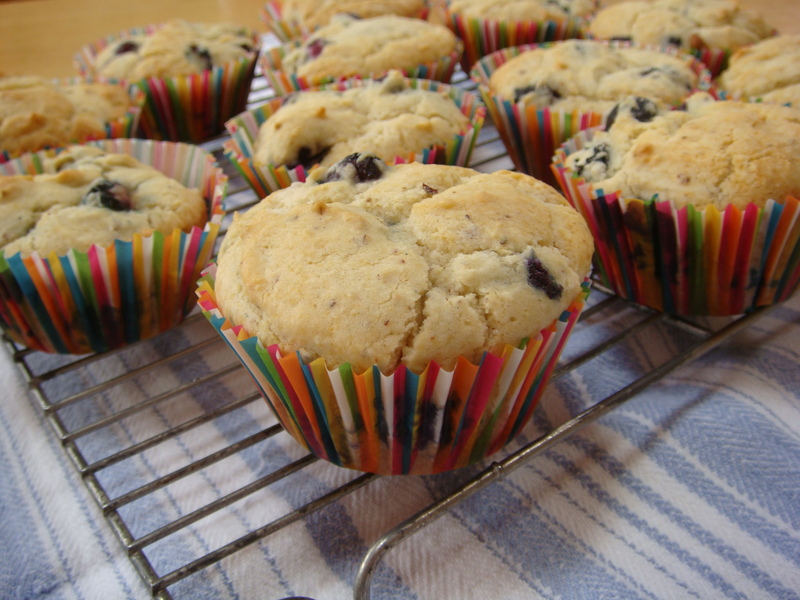 ), Multigrain, Apple Cinnamon and Frosted. Naturally, those of us who have celiac disease and other intolerances, allergies, and darn good reasons to stay away from gluten, are wondering two things: Is it safe? How does it taste? Well, I can answer one of those questions. 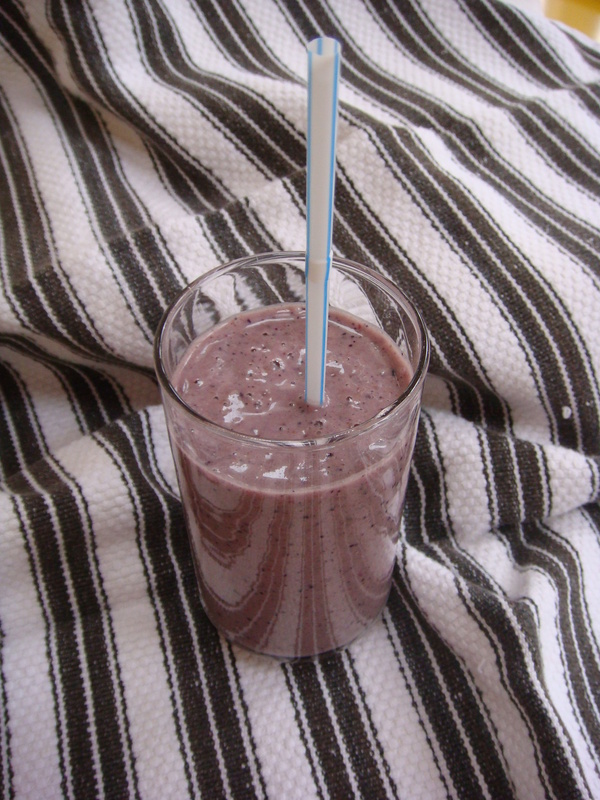 February Foods We LOVE! Quinoa! Several years ago if you would have asked me what quinoa was, I would have had the “deer in headlights” look on my face! Quinoa (pronounced keen-wa) is probably the most perfect plant protein that can be found! 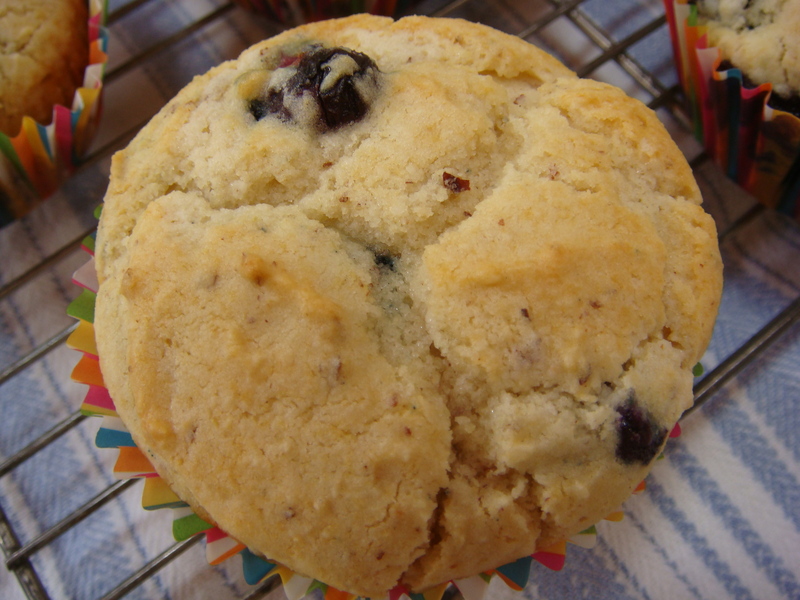 Naturally gluten-free and wheat-free, this is THE perfect food for those of us who suffer from celiac disease or have gluten-sensitivity. Nutrient-rich, quinoa has anti-inflammatory properties, contains all of the essential amino acids, and is a great source of manganese (migraine sufferers often are lacking this)! I am comfortable cooking quinoa and anyone who knows me, will tell you that I LOVE to collect recipes and will try any recipe at least once. That being said, I discovered this amazing breakfast quinoa. Being a “Martha Stewart Wanna-be” (as far as crafts and recipes go), I learned that she has a video series called Eat Clean with Shira Bocar, the Martha Stewart Living food editor. 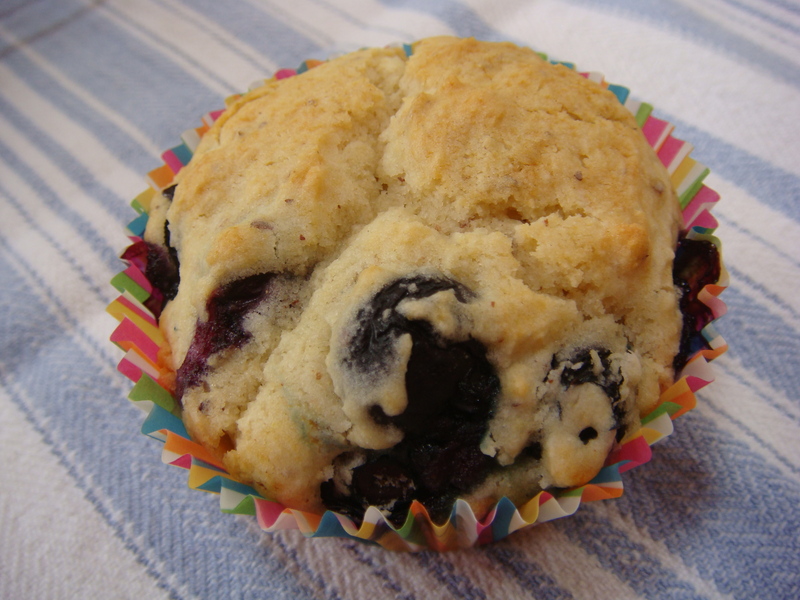 The recipes in this series are simple and nutritious. 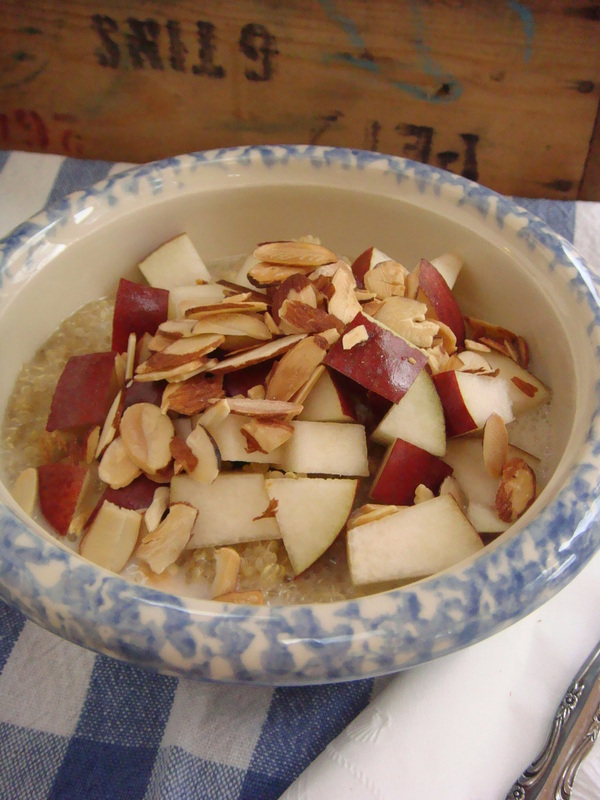 Here is a link to my new favorite quinoa recipe, called Quinoa Porridge! 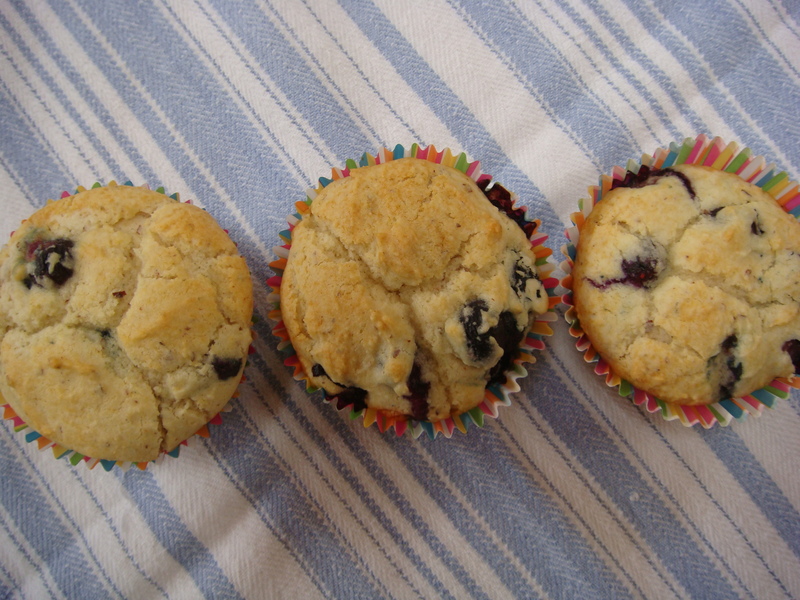 I wrote down the recipe as Shira spoke on the video, so here it is! Swirl ingredients and then bring to a boil. Reduce to simmer and cover for 16 minutes. 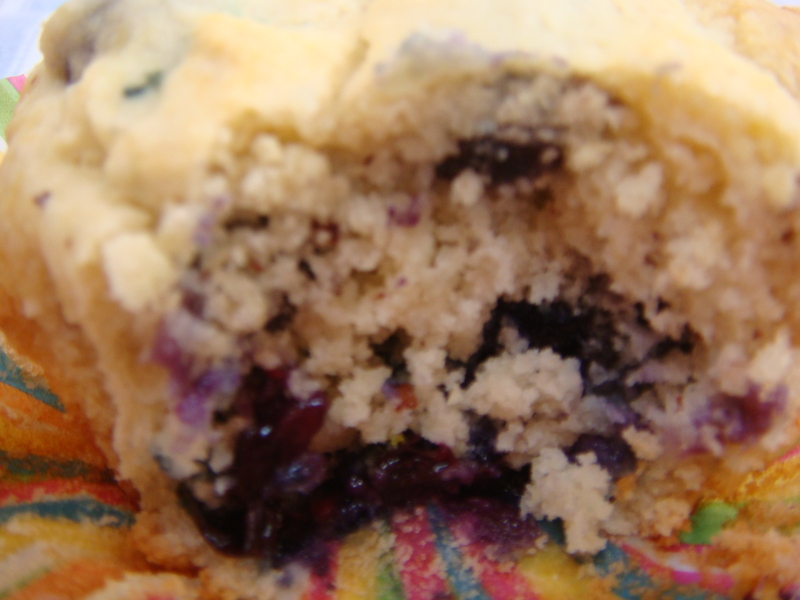 When done, fluff with fork and set aside. Chop half of a pear into bite-size chunks. Grab a handful of toasted sliced almonds. 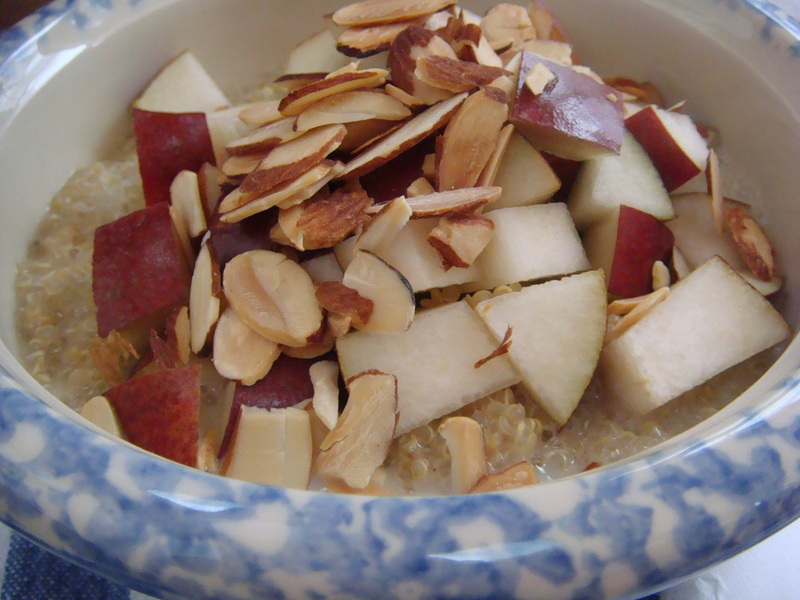 Assemble the porridge by placing quinoa in the bottom of a bowl. 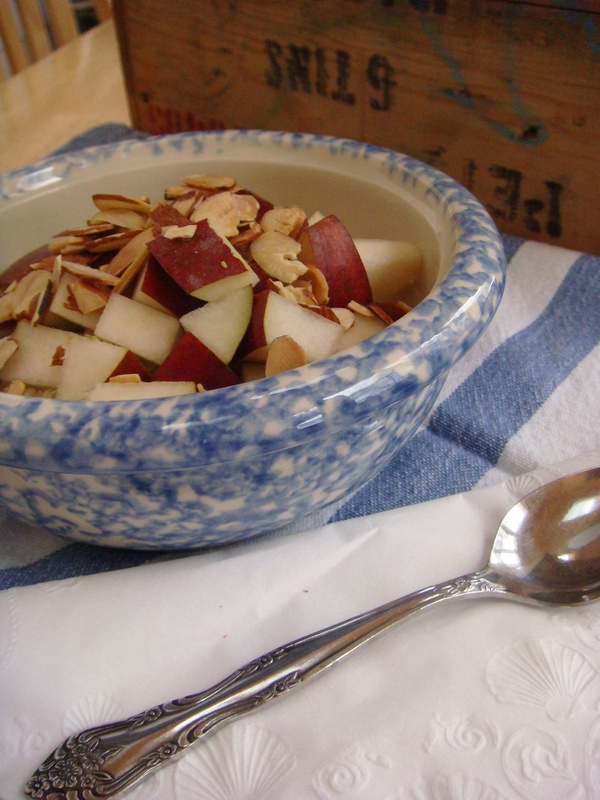 Add some almond milk, place chopped pear on top and garnish with toasted almonds. Quinoa can be eaten for breakfast! Quinoa is a seed, not a grain! Quinoa will keep your tummy happy! 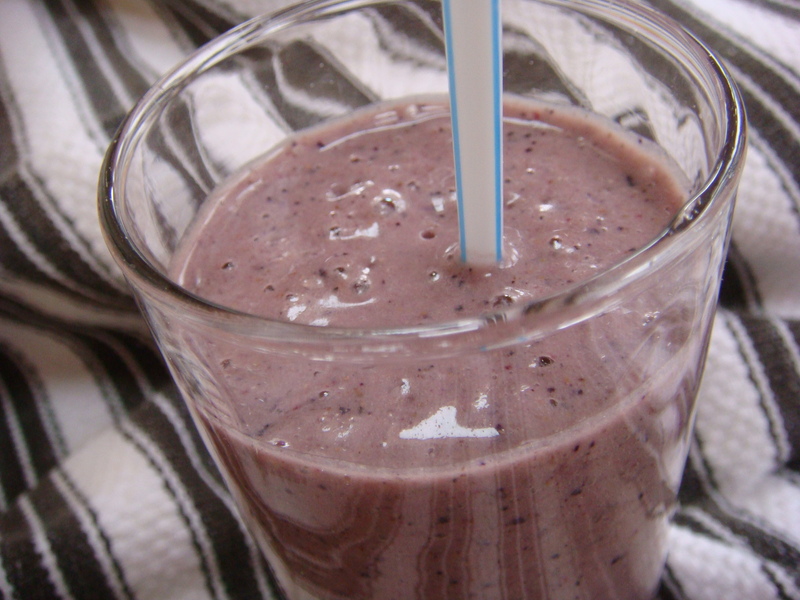 February Foods We LOVE! Ice Cream! Ice cream is a food that we can eat anytime, any season, right? 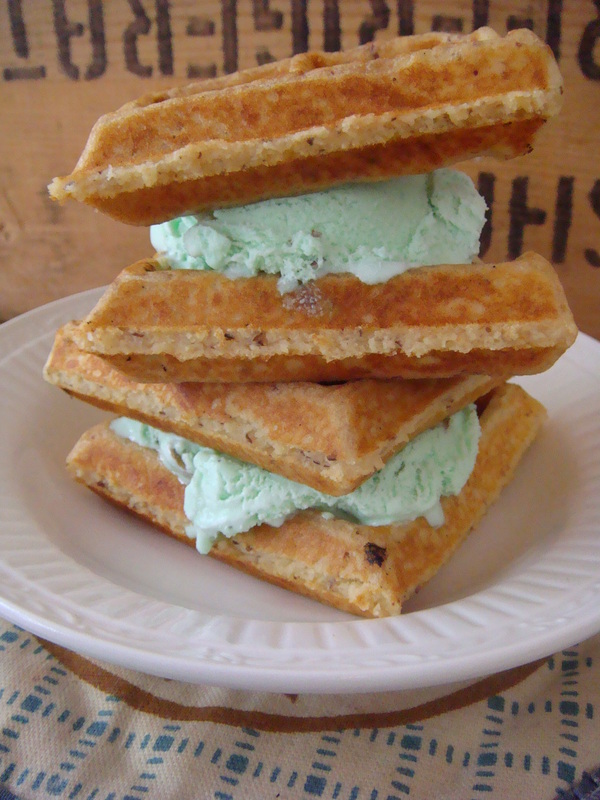 Well today is “Eat Ice Cream for Breakfast Day” so who’s ready to celebrate? Oh so many flavors, so little time to eat them all….we decided on a pistachio almond that is so smooth but has the great crunch that we are craving! 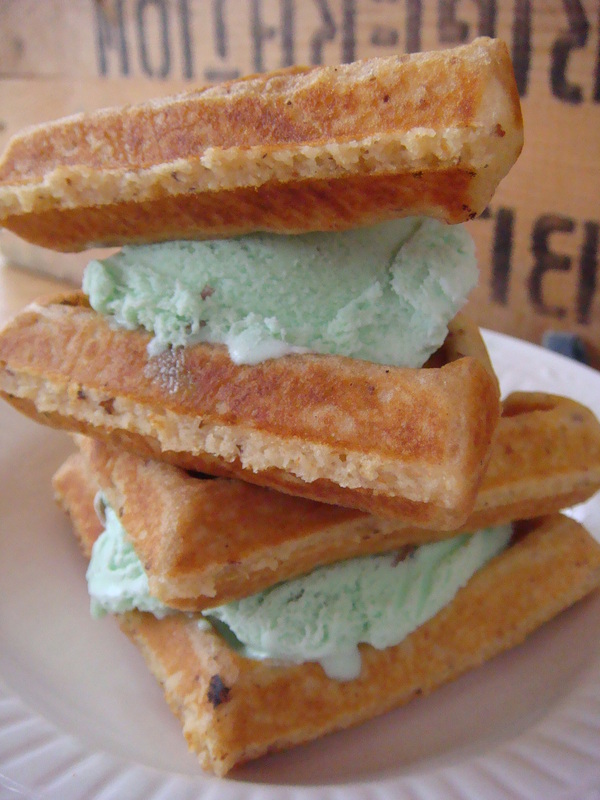 And of course, since it’s breakfast, we decided to combine the ice cream with gluten-free waffles to ramp it up a bit! 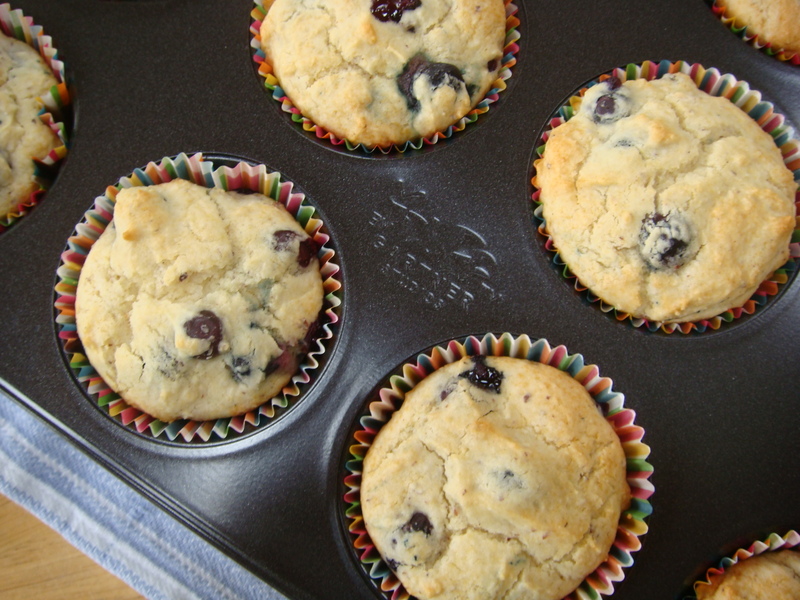 We used Pamela’s Baking Mix! When Daria was little, she and her sister along with all of the neighborhood kids and parents, used to descend upon our house on the 4th of July. Why? Because we lived near a hill which overlooked our local high school football stadium and that’s where the city would have the fireworks show! After the wonderful display, everyone would walk back down to our house and we would make waffles and ice cream for everyone! It became a tradition! Then when we were diagnosed with celiac disease, our celebration changed. We continued to make waffles and ice cream for everyone, but for the first year or two, we only indulged in the ice cream. 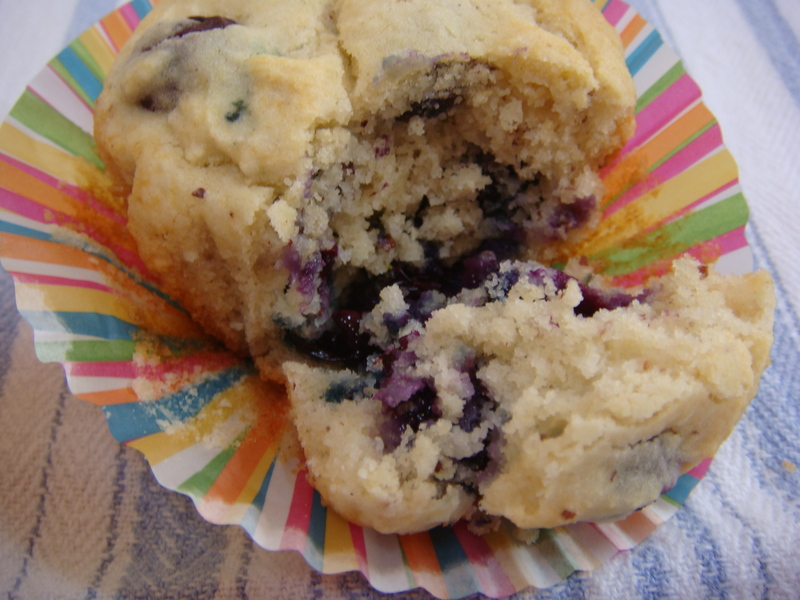 Once we learned how to mix the flours, we searched for waffle recipes. In those days, there were no mixes! Bottom line, we survived it and it’s the memory of the fun times we had all those years that’s important! We’ve since moved away from that wonderful neighborhood but still stay close to the best neighbors anyone could have! 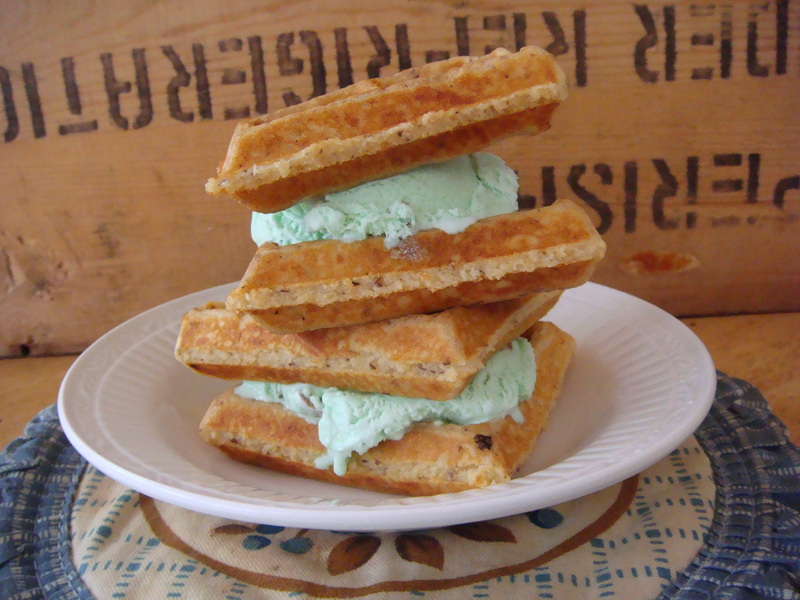 If you want to make some great memories, fire up the waffle maker, get out the ice cream and invite your neighbors, friends, and family over!